Today Francis First Charger came to visit our lab to provide some much-needed encouragement and guidance. 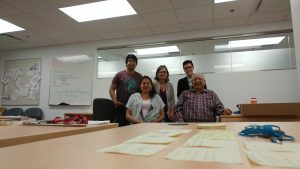 Francis is one of the resident elders at the University of Lethbridge, and was able to make some time to come downtown to see our lab, even though he is a very busy man! We were very grateful for his prayers and support. Our work is sometimes tough and has some difficult moments and things that we have to work through. We have become a good team over the last little while and the team members really support and help each other with anything that’s needed. It was very good to have some advice and encouragement from Francis today.